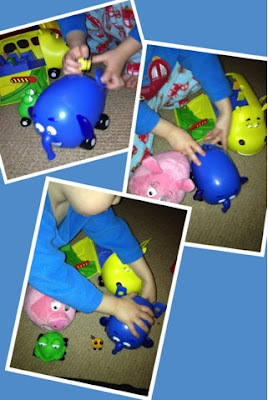 We were absolutely over the moon to be sent a host of Jungle Junction toys by Flair to review. Jungle Junction is Disney Junior's BAFTA nominated pre-school series full of adorable animals on wheels, lots of vibrant bright colours and puzzles for children to help solve. Both Blake (nearly 3) and Maegan (9months) helped me review them! 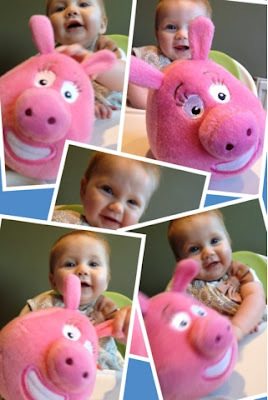 Maegan loves the fluffy pink Zooter plush, this cute little piggy on wheels is a winner for children aged 10months +. Maegan found great fascination from pushing zooter along the floor and pulling it by the ears and playing with the wheels - I'm impressed with how long this toy kept her entertained! We also had a pull back Ellyvan which you pull back and let go - this gets quite a bit if distance going on our wooden kitchen floor - its also not bad on carpet! Great details include a trunk which you can turn as it makes a clicking sound and the rear doors actually open - you wouldn't believe what Blake has managed to fit in elyvan! We also got sent the Hippobus beetle bug playset. If you ping Hippobus' ear, she makes a great selection of sounds including contagious cute giggling, bing bongs and beeps! There are 5 brightly coloured little beetle bugs and each has it's own colour coded seat in the bus. 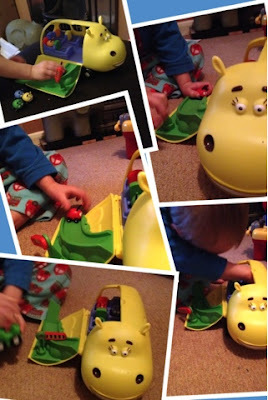 There is a small door or a big door to chose from - the larger one opens up to reveal an awesome extending slide for the beetle bugs to play on, there are also two road signs included and a card playmat and sticker set. Always a winner- this comes with batteries included! Wow! Well done Emma, both Blake and Maegan look like they are having lots of fun with those gorgeous toys. My son loves Jungle Junction and so do I. 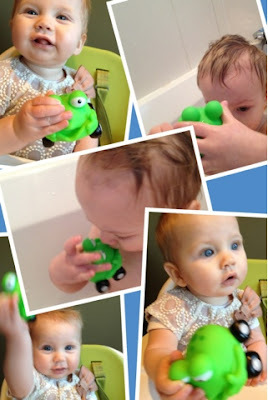 Poor Blake was full of cold and it showed - otherwise they'd be more pics of his beaming happy face - he's loving the toys!